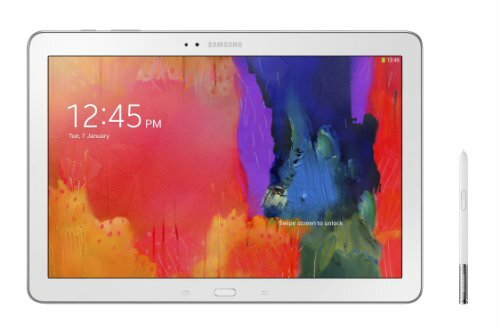 Samsung Galaxy Note Pro 12.2: the iPad I always wanted? This brief review may seem a little out of place for a site dedicated to the Surface Pro and other Windows tablets and convertibles. But if you've read enough of these posts, you'll know that I'm fairly tech agnostic. Like many of you, I'm willing to look under any rock to find the ideal device to satisfy my creative urges. When the iPad was first introduced in 2010, I was primed for just such a content consumption device. But the touch interface and the many pens and art apps that were eventually released for the iPad hinted at a greater opportunity: the possibility of producing real work on a tablet. The Surface Pro and other Windows 8 devices I write about here have largely addressed the working side of the equation. But that productivity has come at a price: added thickness, weight, heat and shorter battery life. And truth be told, Windows 8 has yet to deliver the diversity of entertainment apps and the couch surfing elegance of iOS. The Samsung Galaxy Note Pro 12.2 and its tiny S-Pen. It includes an extractor and five replacement nibs. At first glance, the Samsung Galaxy Note Pro 12.2 appears to be the tablet I always dreamed possible: roomy 12.2 inch screen, 1.45 mm thinner than the iPad 3 and only 100 grams or .21 lbs heavier. And to top it off, an ultra high resolution display (2560 x 1600) with a Wacom active digitizer. 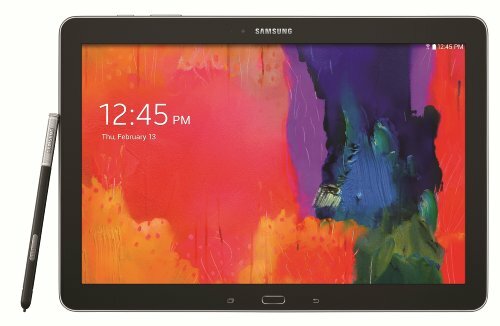 Clearly, the Samsung Galaxy Note Pro 12.2 is designed for the power tablet user and at $749 for the 32 GB model I've been testing, it's not cheap. But compared to the pricing of the 32 GB iPad, a $150 premium seems reasonable for the additional screen size and Wacom tech. Battery life is outstanding (at least 10 hours) and the fanless tablet is still very cool to the touch. The faux stitched leather back has been ridiculed by some, but I personally think it feels great in my hands. I saw one review criticize its weight and just had to laugh. If this is heavy, what does the reviewer think of the Surface Pro? I'll let other tech blogs quibble about Android's suitability for business use and the merits or weaknesses of Samsung's heavy handed UI choices. I personally don't care for any flavor of Android I've ever tested, including plain vanilla. Customization is fine, but Android options are out of control. I find the whole experience confusing and redundant. But frankly, that's all very secondary. I have two simple ambitions for my ideal tablet: entertainment consumption and digital art creation. No faux office apps for this guy! I'm a big digital magazine and comic reader and the reason I've always lusted after a bigger screen tablet is to avoid having to read reduced pages. For example, an issue of 3D World magazine is printed at 8.7 x 11.8 inches. To read that on an iPad, the page has to be reduced by 34%. On a Surface Pro, the page width must be reduced by 40%! On the Galaxy Note Pro, the page width only needs to be shrunk 25%. (Page height will fit with only 13% reduction on the SGNP; I'm still pining for a tablet with the aspect ratio of paper rather than 16:9 video). A 9% size increase may not seem like a lot, but when you're looking at fine magazine print it makes a big difference in readability. Comixology's Comics app running side by side on the Galaxy Note Pro 12.2 vs. the Surface Pro 2. Though only 15% larger, size matters. On the digital art creation side, the only widely known app available for Android is Autodesk's Sketchbook Pro. Coming from the Windows desktop version, however, this edition feels slightly undercooked. Basic settings such as dpi are missing and file handling is a bit of a mystery. For example to load a file, you must first select Gallery which will display previously saved SBP projects. Over on the right side of the Gallery page, you click on a dropdown to select New from image. Then you click on the source directory and finally navigate to your picture. Forced to draw with the S-Pen stylus in Sketchbook Pro, I really missed Manga Studio's brush stabilization and the control offered by the replacement pens available for Windows tablets. Drawing with the S-Pen is very smooth and responsive, but overall I felt a lack of control perhaps due to the tiny size of the stylus. Wacom compatible tablet pc pens will work on the Note Pro, but the pointer doesn't align perfectly with the pen tip. Every replacement pen I tested had the same issue: drawing takes place slightly below the nib, making it next to impossible to draw precisely. If you don't mind Sketchbook Pro for Android's quirks, and you have small hands or are accustomed to the S-Pen from other Samsung devices, this tablet is great for sketching on the go. Unfortunately, if you've been spoiled by Windows desktop apps like Photoshop or Manga Studio and/or prefer a heftier stylus, the Galaxy Note Pro 12.2 won't quite cut it. UPDATE: Make sure to read the comments section for a great list of alternative paint apps to try as well as some S-Pen calibration tips. SurfaceProArtist readers are awesome! I can't recommend this device for serious artists, but for light doodling and entertainment consumption, it's the best tablet available and I would love to see Samsung take another crack at the Windows platform. Purchasing from these links directly supports the maintenance of this site.